suggests tighter for lead and swagged lead. Anyone care to chime in with experience? I'm at .463 and it doesn't blow up. Seems to improve the burn.
. 468 crimp. Shot at 25 yards from a rest while chronographing. Can you explain how to measure the crimp. 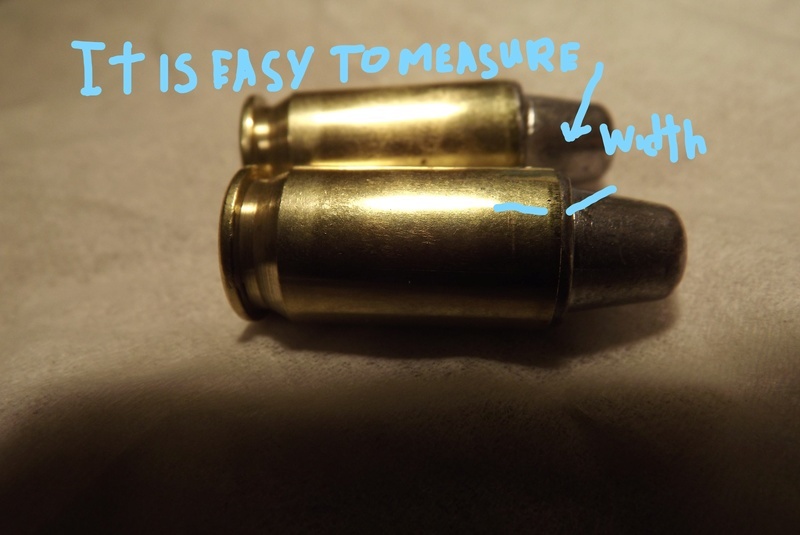 unfortunately, I think most shooters have a difficult time accurately measuring crimp. most use calipers, using the thin edge (still probably .020 thick)just allow the crimped brass to seize in the gap. I have several machined holes of known diameter. If one enters one and not the other, I know what the crimp is. others, Like the late J. Keefer, might use an optical comparitor! Good topic! The more I know, the more I really don’t know. Sorry, my entire post didn’t show up completely. From past discussions, my understanding was that the lesser the crimp, less damage to the lead bullet resulted. Thus, more accurate rounds were made. Obviously, many have had good success with tighter crimps. An advantage which I can appreciate would be the cleaner burn. 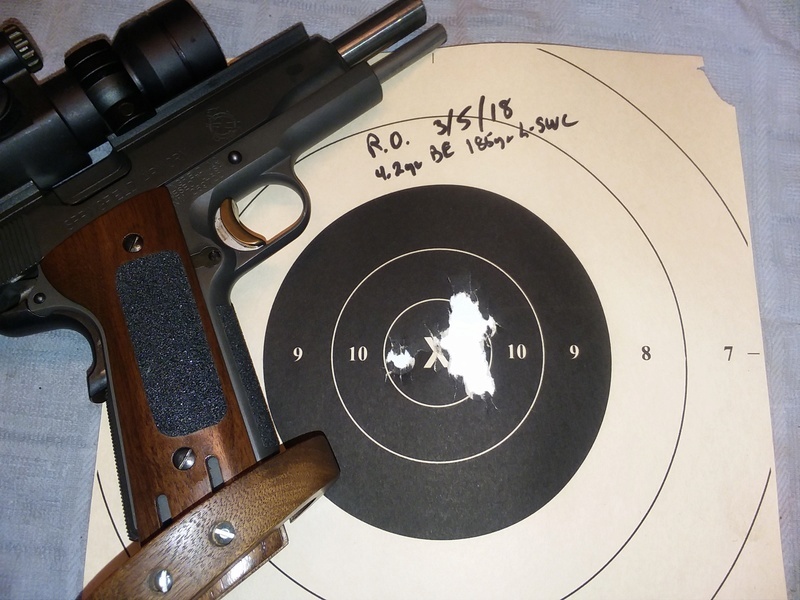 With 3.8 gr BE powder and my .469 crimp, I experienced a lot of crud buildup and quickly although the rounds were very accurate. The only meaningful test groupings would be done at 50 yards and not at 25 yards. 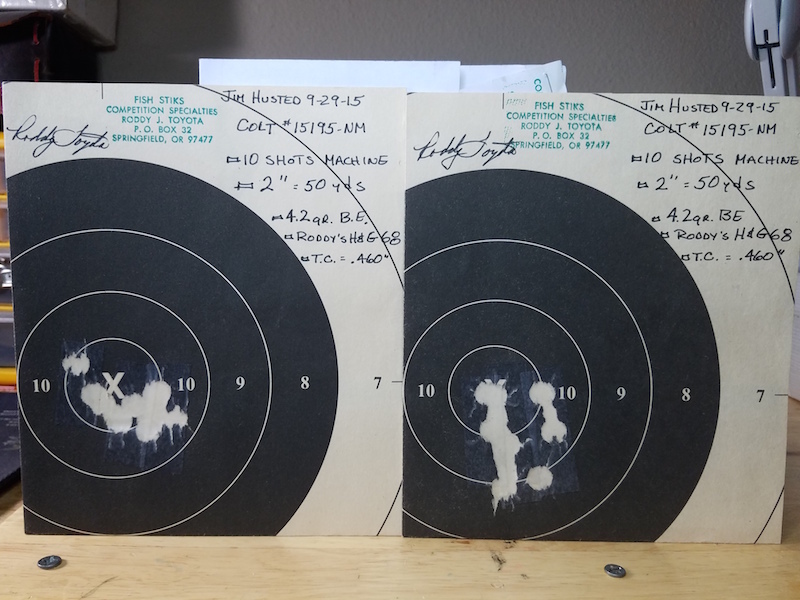 Are there any shooters who have tested their rounds with the looser and tighter crimps for accuracy and be willing to share their results? Thanks in advance. I think it depends on what crimper one uses. It seems like the Star crimp works well with a tight crimp, while others, like Dillon, work better with a .470 ish crimp. I think that, back in the day, Giles recommended the tight crimp. It's tough to argue with that kind of expertise. That being said, the machine rest at 50 yards is the real test. Dang! That adds one more dimension to the Ransom Rest testing I will be doing this summer. Thank you Don! A friend who uses a Star reloader also uses a tight crimp, although not sure of the exact measurement. He is a fan of Bob Chow and owns several of Bob’s 1911’s. Looking at some of the old Gil Hebard catalogs of the 70’s, Star seem to be the only progressive reloader available at that time period. BE Mike may be on to something. Reputable old timers probably did extensive testing and found tighter crimps such as .463 to be the best (with the star). This is just conjecture on my part until we hear from some of these knowledgeable old timers or those who were close to them. I have Dillon equipment. Accuracy is not the only reason to try different crimps. 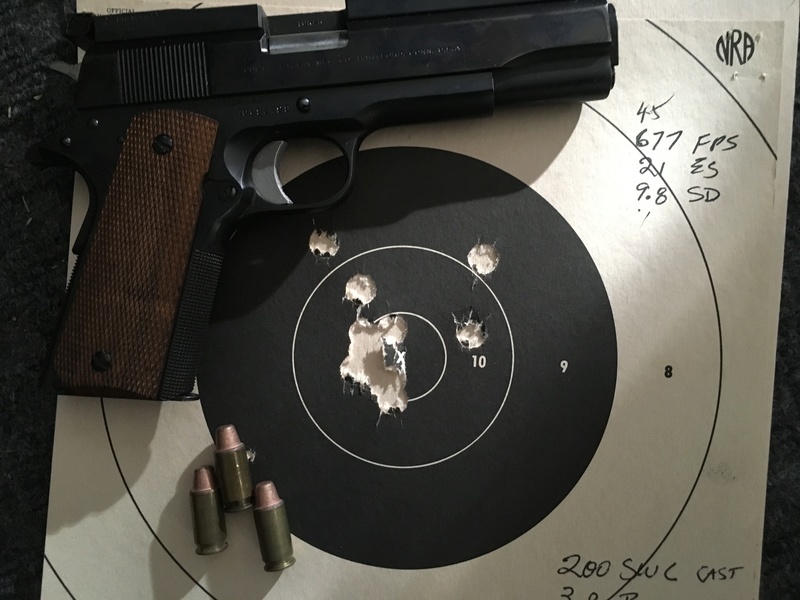 On my Salyer built 1911 it functions better with a .464-.465 crimp than a 4.69 crimp (using 185 grain lead swc bullets) While accuracy is important an un reliable round will probably cost you more points than a slightly less accurate but reliable round. Just my two cents worth which with 5 bucks will get you a happy meal. Talk about a tight crimp. Look at what Roddy Toyota put on the ammo he used to target my wad gun. Yikes! I use .463 (as close as I can measure) I was under the weather yesterday and was not able to shoot our local match. So when the sun snuck out today so did I. 10 shot group (25yd) with hand on a rest. Some vertical stringing with one flyer but overall almost acceptable. It was the first time trying out the Aimpoint on the RO. RO is mostly stock. Seems like the gun shoots ok Len. I thought I should mention that I don't really measure my crimp anymore. It is too hard to measure without go-nogo gauges. Instead I measure the length of my crimp. I use a Dillon taper crimp die. I figured out years ago that I need a crimp .050" long to give me my desired .463 crimp (lead bullets). Multiple schools on this and there many different results. Gertrude Backstrom Taper ; F Bob Chow None ; GP Defino Light; William Guiette None; Gil Hebard Taper to .460; John Hurst None; Ellis Lea None; Harry Reeves Light; WT Toney Taper. So there’s hardly a consensus here. Al Miller in Handloader wrote an entire article on this very subject inHandloader 54 in the mid 1970s. His accurized pistol preferred a very light taper and his GI 1911A1 would not tolerate ANY roll crimp at all. The upshot of all this? You have to test what your pistol likes. Start with a taper crimp. Since the case mouth diameter is close to .471 with jacketed loads, you have .011 to play with. I wouldn’t crimp below .460. - vary the crimp from .471 to .461 in 2 thou increments. Then go shoot holes in the x. Too bad we don't know what cases they were using back then. In my gunsmithing days ('51-'83) I specialized in target pistols, primarily .45s. Early on I would get customer complaints where the gun failed to go completely into battery, i.e. the slide did not go all the way forward. Nearly always the cause was a reload with a short case. The case had been flared to receive the bullet and the standard roll crimp did not quite remove the flare. Or alternatively, the customer believed the case should not be crimped at all and the roll crimp failed to straighten the flare which would hang up in the taper of the .45 chamber. The answer, of course, was to sort the cases carefully, eliminating the short ones. As usual, not everyone wanted to bother. Another disadvantage of the roll crimp was that the degree of crimp varied directly with the length of the case. Long case, hard crimp - short case, no crimp. This caused not only malfunction but inaccuracy as well. Since I test fired every gun at least 100 rounds and guaranteed a specific level of accuracy. I looked for a way to avoid trimming all cases to a standard length. But I could not afford to discard the short ones. My previous toolmaking and inventing experience led me to the tapered crimp. It requires a separate operation, of course, but has several advantages over the roll crimp. One was that a slight difference in case length made little difference in the degree of crimp. Another was that cases lasted a lot longer before splitting. The taper crimp did not “work“ case mouth brass as severely as the roll crimp. Crimp-caused malfunctions were eliminated. The taper crimp also prevented telescoping, where the bullet slides back in the case when it hits the loading ramp. Finally I seldom had to discard a case because it was short. So what kind of accuracy are we talking about for these taper crimped reloads? First a bit more history. It soon became apparent that my time would be better spent if I bought reloads even though I had two Star reloaders. Fortunately, I knew a few really capable reloaders. Gene Wilson and Joe Maszk come to mind. Frank Shuster was a top bullet caster also. Joe Mazak loaded sample quantities of those good bullets with powder charges from 3.3 to 4.4 grs. of Bullseye, taper crimped to about .463” at the case mouth gave the best accuracy. Cases were all one kind and loaded on Joe's Star machine. Seldom did I see factory ammo that would shoot as well, and when I did, the military guys had it. And the numbers? Well, I made more than 4,000 target .45s over the years and must certainly have fired at least half a million taper crimped .45 reloads. I guaranteed each .45 capable of shooting five shots into 1-3/4 in at 50 yds. and fired an average 1-1/4 in test group. My personal best from a Colt .45 was 5 shots in .39 in. at 50 yds. And I had a fair number of groups at sub in. Under 1 in. was not uncommon at all. I didn't always send the best test group with the pistol but I did always include loading data. I designed a taper crimper for the Star machine so there was no extra operation. Ernest Whalen of Heatbath Corp. made and marketed the taper crimper for a number of years, paying a small royalty for use of my design. My customers had most of the above info. Guess I should have made it available to all handgunners. But I tend to put things off, like trimming cases, for instance. james r chapman wrote: Too bad we don't know what cases they were using back then. In the Pistol Champions’ article there was no mention of cases used. Gertrude Backstrom stated she used primers “depending on make of case” which would indicate that she sorted her brass by maker. Other than that no indication. I would imagine that the vast majority used military brass on the short line and commercial cases of one make at 50, though I have no information to back me up on that. I've never given a whole lot of attention to the crimp. I set it on the press and thought what I had was good enough and moved on. I use a Lee die set for 45 ACP and 38 Special which includes a "Factory Crimp" die. I do no know if it's a roll crimp or a taper crimp. If someone here knows please let me know. I'm curious. The “Factory Crimp Die” is more roll than taper. But it is accomplished differently in that there is a collet that squeezes the mouth of the case in radially rather than wedging the mouth in from a bevel.